2850829 Luke Skywalker Watch was a Star Wars Time watch released in 2011. This is a description taken from LEGO.com. Please do not modify it. (visit this item's product page) Connect and build with Luke Skywalker™! 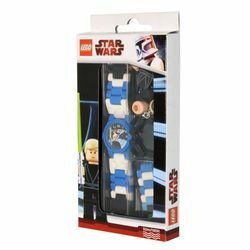 •Includes a Luke Skywalker™ minifigure, with lightsaber! •Watch face features an image of Luke Skywalker on a Star Wars background! •LEGO ClicTime watches are tested to ISO standard 2281 to a static depth of 50m. This means that our watches are splash proof. •Watch face measures 1" (2.5cm) wide. This watch is produced by ClicTime, who refer to it as 9002892. Facts about "2850829 Luke Skywalker Watch"
•Includes a Luke Skywalker™ minifigure, with lightsaber! •Watch face features an image of Luke Skywalker on a Star Wars background! •LEGO ClicTime watches are tested to ISO standard 2281 to a static depth of 50m. This means that our watches are splash proof. •Watch face measures 1" (2.5cm) wide.